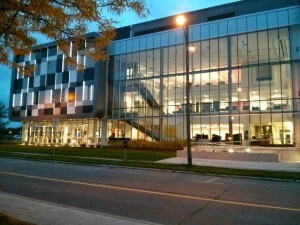 Yesterday afternoon, in the atrium of the University of Waterloo’s Stratford Campus, a packed room forewent what was likely the last nice weekend of summer to join Peter Mansbridge and guests for a discussion around “What’s the future of the library in the age of Google?” It was aired on CBC’s Cross Country Checkup on CBC Radio One, available here. It was an interesting discussion, tackling major issues such as what local libraries should do in the digital age, issues of universal accessibility, and whether we should start shifting away from a model of physically acquiring sources (notably books) towards new models for the 21st century. Historians, and those who care about history, have much to contribute to these sorts of conversations. Those who know me or have read my writings over the last three years know that I’m not a luddite. But I came away worried about some of the assumptions made in the conversation, and what they mean for us who write about the past. A big crowd of folks who care enough about libraries to spend a beautiful Sunday afternoon in a university building lobby. I don’t want to rehash the conversation, as you could rewatch it, but a brief summary of some of the main themes might help. The broadcast began with Peter Mansbridge asking the major question “Digital technology is changing the way we store information, and how we learn from it. Does it make sense to stack printed books in costly buildings when virtual libraries are just a mouse-click away?” Mansbridge was joined by Christine McWebb, director of academic programs at the Waterloo Stratford Campus, and Ken Roberts, former chief librarians of the Hamilton Public Library and a member of the Royal Society of Canada’s Expert Panel on the Future of Libraries and Archives in Canada. While there were quick nods to the importance of libraries for preserving and making available material that documents our cultural heritage, the discussion largely revolved around new opportunities. McWebb noted the large resources that Google users can now access and, at least partially in light of that, saw libraries as shifting from the acquisition of physical resources and their storing and archiving to themes of curation and quality control. There were plenty of examples: Florida Polytechnic University’s new library (not without flaws, McWebb noted) that has no physical books, the amount of users who access free WiFi, and the role librarians can play in helping visitors make sense of what’s reliable and what’s not on the web. I’m not doing justice to all of their points, but this set off a fruitful discussion. In particular, there were interesting points around the issue of universal accessibility – who gets left behind when we go digital. Roberts made the interesting point that youth across the socio-economic spectrum, for example, purchase smartphones; the differential is who can afford the expensive data packages. The library then provides a good outlet. I was less convinced by some of the discussions around reading e-books on smartphone screens, which even I find are too small to really get into the medium. I think the most unsettling point for historians, however, was the occasional whiff of a triumphal move towards “curation and quality control” and away from physical materials. Google, of course, doesn’t have everything, and they – along with many other tech companies – have an uneven record towards the past. As Andrew Berger, digital archivist at the Computer History Museum, reminded me on Twitter, Google acquired the USENET archive DejaNews. This is an invaluable record of the early story of the Internet, and Google’s search engine makes many older postings virtually inaccessible (it takes a lot of digging, and complicated search strings, to dig any meaning out). I’ve written on and on for this site on how Yahoo! has destroyed history, both with MySpace blogs and Yahoo! messages. Just because it’s digital doesn’t mean that it’s going to be available forever. In fact, it’s often the opposite. Most early webpages are completely gone, and only with the Internet Archive’s scrapes beginning in 1996 do we have some preserved remnants of our early digital culture. When I’ve done work on mid-1990s web culture, I’ve often had to fall back on print resources: GeoCities for Dummies for insight into website creation tools, Government of Canada print resources to learn about dead and unarchived CRTC discussion portals, old computing magazines to learn about what these sites worked with. We’re really good at preserving paper, but unless we start really funding it, we’re not a world leader in preserving digital objects. This matters because if libraries decide not to collect books, but rather electronic objects, we need to worry about the long-term plan. Will they be accessible in ten years? Fifteen years? Thirty years? Will they be so proprietary that libraries can’t manage this process themselves? What happens when distributors go out of business? Or if a book seems so useless that nobody decides to update it, so in fifty years when the historian comes along they don’t have access? If you think I’m exaggerating, go try to find an old file from the 1990s or even more fun, an old floppy disk from even the year 2000. Maybe it works, maybe it doesn’t, but you can’t take it for granted. My fear is that if we drastically move towards acquiring digital rather than physical resources, are we matching that with research and active work in the field of digital preservationism. Opening a file from even ten years ago can be a serious undertaking. What happens if file formats change? Will we keep migrating this information? What are the lifespan of the e-resources that we collect? Governments are removing online material, Roberts says, and it can be difficult to keep track of that information. 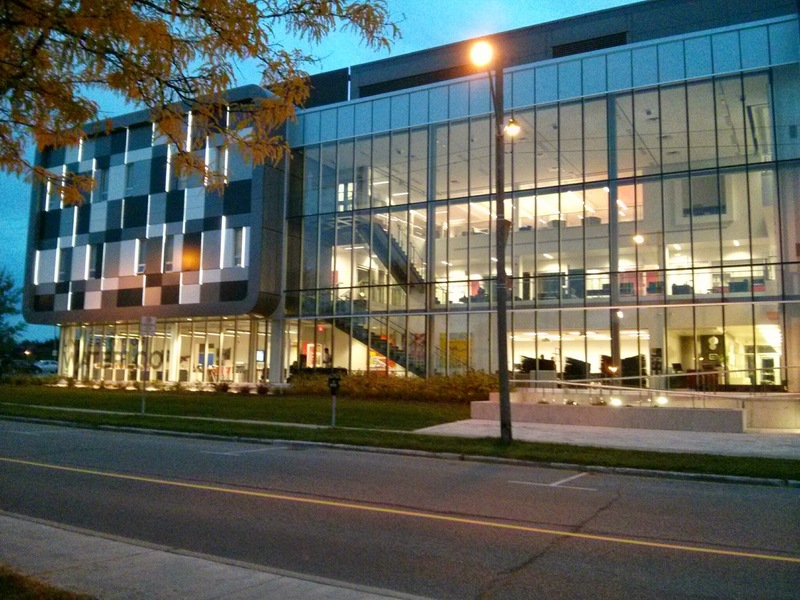 Stratford campus at sunset – a campus without a library. All of this speaks to some cautionary notes. Technology is great. But it’s not a magic bullet. If we’re serious about moving libraries to a digital age, we have to of course think of those who might be left behind, but also about what sort of historical record we’ll be leaving for our future generations. Ian Milligan is an assistant professor of Canadian and digital history at the University of Waterloo, although this was his first visit to the Stratford Campus. While he doesn’t think of himself as a luddite, he still reads a print newspaper every morning and prefers print books in certain contexts. He also wants to thank his partner, Jennifer Bleakney, for giving up her last Sunday of summer to tag along to listen to him worrying about our digital heritage.